Welcome to all! I'm pleased to host this week's Poetry Friday Round-up (go here for full details thanks to Renee LaTulippe if you're new) and to make good on my promise to report from my pretty glorious last week in Chicago at the Summer Poetry Teachers' Institute. You'll also find links to all the other cool poetry posts around the web down at the bottom. I can't remember how I discovered this institute, which is offered free of charge and includes accommodation at the conveniently located but very dorm-like dorms of the University of Illinois at Chicago. There was a short application form to complete back in April, and then I was notified of my acceptance--it was that simple. It's unclear to me if there were folks who applied and were NOT accepted, but the Institute, which has sections for Elementary, Middle & High School, and Community College teachers, served about 80 people (very unsure of that number) of whom 20 were in my nicely diverse PK-5 group. If I sound like I'm selling this program, I am. You'll see from the schedule below how varied the sessions were and how practically useful the outcomes were at a number of levels, and how time was allocated for processing as well as rest, tourism or home life, according to preference! We began and ended the week all together with Carol Jago, familiar to me from NCTE--a true teacher leader. There wasn't a lot of difference between the "seminars" and "workshops"--they were all excellent presentations that often included opportunities to write for ourselves or to plan for our classroom practice; there were handouts and modeling, and in several cases, the gift of books! We all received a book collection from the Poetry Foundation which included an Engle book, The Flying Girl, and Ted Scheu gave each of us a signed copy of his Someday I'll Be a Teacher. POETRY IS ART CLASS WITH WORDS. This came from Beth Sampson, who runs Hands On Stanzas, a Chicago poetry-in-the-schools project. She outlined the first five lessons which this organization's poets do in classrooms, and thereby all my best practices as a poetry teacher became a newly organized, explicit, intentional approach with structure and labels! Concept #1 for kids (and perhaps teachers) with little familiarity of "what poetry is" uses children's experience of art class--a special subject carried out by a specialist teacher in a different room in most districts--to "do a lot really fast." By comparing the variety of materials, processes, and products that constitute ART, this definition clarifies the broad range of writings that can be poems, the endless ways that words can be used to create them, and the idea that we are using words in different and special ways when we make poetry than when we do other kinds of language work, especially in school settings. Being able to "draw on" their shared experience of Art with our seriously excellent art teacher, Leela Payne, will make that leap to writing work nearer to the beginning of the year. I can't wait! The other transformative concept from Hands On Stanzas is one that I carry with me as an implicit assumption--that all kids are poets. WE know that, but often they don't know that, so it's important that we let them know that just as in art class, they all come with all the creative tools they need to be successful. They'll just be applying them in new ways. Do all kids come to art with excellent scissor skills? No, so we model and teach and share techniques and they get better at cutting--but 99 times out of 100 they know WHAT they want to cut and what color it should be. Here are some photos from the week, many taken by our Chicago Public School facilitator Shamika Keepers. We were asked to bring one indispensable resource. I couldn't get it down to one! We had time to explore the glorious Poetry Foundation Library. I recognized a friend! The many breakout sessions on the schedule were for self-selected groups to work collaboratively on poetry projects for the classroom. We were encouraged to make maximum use of the Poetry Foundation's website, and the culmination of the week was a Curriculum Fair at which we displayed our concepts Science Fair-style. Here were some of my favorites--not all from the Elementary section, either! A middle school idea which I loved--and I was so happy to introduce the group to Valerie Worth's small poems! This was our group's project, designed to work up or down PK-5. That's my fab new friend Chii. See my Metaphor Dice? and I shake your hand. You smell like sky upside down water. exactly the size of my face. You make everything more brilliant. So, there is a good some of it, but not the sum of it! If you are a teacher, do apply for next year, and maybe I'll see you there, since repeat offenders are welcome. And now....the Round-Up! Please leave your links in the comments and I will line them up old-school throughout the day. Thanks for joining us today! Linda Number 1 is sharing a jam sandwich at A Word Edgewise. Linda Number 2 has popsicles--four flavors--at Write Time. Now, who has the main course? Alan has fighting words for beating the blank page at Poetry Pizzazz. Sally is dealing with a very very very challenging misfortune: Too Many Books. Diane is in with an original called "Pictures of Liberty" over at Random Noodling. And at Kurious Kitty you'll find two anniversary poems by Douglas Florian. Tabatha has a found poem from The Hare with Amber Eyes, to which she refers like everybody knows The Hare with Amber Eyes. 😉 Read this beautiful object at The Opposite of Indifference. Matt will be cooling us down with an original called "Summer Frost" at Radio, Rhythm and Rhyme. Laura Number 1 would like to warn you that her post includes a powerful response to the Parkland HS shootings by Tim Singleton. You will also find a link to her stop on the blog tour for Margaret Simon's Bayou Song. Laura Number 2 has been sharing her entries for the March Madness Poetry Tournament and concludes today with her last, "Spurious Sayings." Find it at Writing the World for Children. Our friend at Books4Learning has a very thorough an enticing review of Javaka Steptoe's anthology In Daddy's Arms I Am Tall. Michelle Kogan celebrates butterflies and bees in art and writing over at More Art 4 All. Rebecca lets us enjoy her Summer Poem Swap from Irene about "creepy lakes." I will soon be swimming my curious self over to Sloth Reads to find out what that's about! Jone is introducing a new haiku anthology at Deowriter that includes some of her work. Congratulations, Jone! Fats at Gathering Books is highlighting the work of a young Instagram poet, Caroline Kaufman. Mary Lee reports on a miracle she witness this morning at A Year of Reading. There's more about lakes--not all creepy--with Irene at Live Your Poem. Ruth is sharing poems for travelers at There Is No Such Thing As a God-Forsaken Town. I love airports too, as last week's travels reminded me. Little Willow reminds us to keep dancing over at Bildungsroman. Tara is sharing some Mary Oliver today at Going to Walden. Catherine has poems commemorating the 49th anniversary of the moon walk at Reading to the Core. At the Mistakes Anthology blog Tabatha has a poem by Michelle Kogan to share. Margaret has a review of Marilyn Singer's new book and a writing prompt to share at Reflections on the Teche. Mandy is following a question this week about disappearing parsley at her blog Enjoy and Embrace Writing. Carol is looking at Long Island through the eyes of Emma Lazarus at Beyond Literacy Links. And now, a flash poem: Molly Hogan's hollyhocks. The End. 😀 Read about them at Nix the Comfort Zone. Christie has also been away at Cornell's BirdSleuth educator retreat! She has hungry herons at Wondering and Wandering. And, to close out the weekend's reading, Sylvia brings a report on her presentation about pets and reading from ILA at Poetry for Children. Thank you for hosting, Heidi! I'm posting and running and coming back to read all your words. I'm afraid I'm quite jealous of where you are and what you are doing. Can't wait to learn more! Thanks for hosting! I wish I could be there with you, Heidi. I can't wait to read more about it! Much envy Heidi as you share your poetry experience. What a celebration of all we cherish about language in general and poetry in particular. Thank you for hosting. I have just returned from the island of Lombok where I had the rare pleasure of swimming in an intensely turquoise ocean, so I understand your admiration for this hue. Today I'm sharing a Battlecry for young poets when facing the challenge of the blank page. Warriors, not worriers! Wow Heidi. What an awesome experience. Makes me want to get on a plane and come over! Thank you for the reportage. It sounds like you had a truly fabulous experience! Thanks, Heidi! I appreciated the virtual institute (and saved the part about poetry being art class with words). Heidi, it looks like you had a blast and learned a ton at this conference! Trigger warning for the poem I am sharing today. It's a powerful response to the Parkland shootings, written by poet Tim Singleton: "Adjusted Curriculum." I also have a link to my entry on Margaret Gibson Simon's BAYOU SONG blog tour. Thanks for hosting. Please add my link for In Daddy’s Arms I am Tall: African Americans Celebrating Fathers. Thanks for this fabulous virtual visit to the Teacher's Institute Heidi! I've taken many notes and pics of your offerings. Wondering if I can sneak in somehow next year–I'm teaching an ekphrastic poetry class in the fall. Thanks for sharing! I have a teacher friend moving back to Wisconsin--so just a short hop over to Chicago. I have passed your post along to her as I think she'd love it. Today I'm sharing the summer poetry swap that Irene sent me about creepy lakes. I love everything about this post--the experience you had, the metaphor for poetry, the photos of cool activities (the little cards with objects glued to the cover are especially calling to me), and the turquoise tile changing to a bowl the size of your face. It's all magic...so glad you got to experience this institute, Heidi! I'm in with my final poem from Madness Poetry, the one that knocked me out, called "Spurious Sayings," at http://laurasalas.com/poems-for-teachers/spurious-poetry-friday/ Thanks for hosting! Hello! Thank you so much for hosting this week. 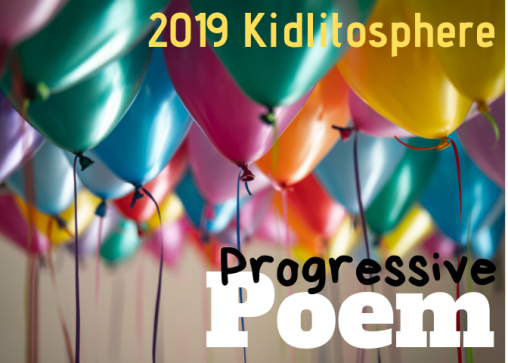 Fats posted something for Poetry Friday at GatheringBooks here: https://wp.me/pDlzr-iIC - "Light Filters In by Caroline Kaufman." As she noted in her review: "Caroline Kaufman is more popularly known as @poeticpoison on Instagram. Caroline is 18 years old and has been writing poetry since she was 13 as a means of coping with mental illness." Thanks again! Heidi, I'm back after having carefully read your post and WOW! Art class with words! Yes, YES! This is how I feel when I'm writing. This is what has pushed me into my "paper crafting" while writing. I need to touch color and texture and shape....while I'm thinking about sound and silence and rhyme. What a wonderful post. Sign me up. I already wanted to go....but now I REALLY want to go! Yes, and it also echoes a little message I've been noodling about how writing of all kinds becomes more engaging, especially for reluctant writers, when we show how it can be literal building, making, crafting a text--"making books". Dummies rule! I think I know what I'll be doing next summer! "Art Class With Words" -- thank you for this amazing takeaway. Can't wait to bring it into fifth grade! I am still gobsmacked: I witnessed a miracle this morning. I hope I wasn't rude--I should give up being defensive about everything I don't know, haven't heard of, etc etc. I realize I only knew Edmund's name--nothing else about him. Thanks as always for leading me to new things I love! Thanks so much for hosting today and sharing all the Poetry Foundation goodness with us! Thanks for hosting, Heidi. I have so much envy over your week in Chicago. Amazing time of connecting with others and with yourself through poetry. Heidi, I forgot to thank you for hosting and providing such a wonderful write-up about your professional development opportunity. It sounds fabulous and I would love to find out more. Carol Jago and I are presenting together at NCTE 18 with Alan Sitomer and Katie McKnight. Your poem offered descriptive ways that turquoise tickled your senses, such as, "You smell like sky upside down water." When you do revise your poem, you should reshare with all of us. Thanks for sharing your experiences in Chicago (Wow!) and your marvelous color poem. Like Carol, I love the line "You smell like sky upside down water." I'm tucking that prompt in my pocket to revisit later! Thanks also for hosting this week. I was inspired to write some poetry about the hollyhocks in my garden. Hi, Heidi, and thanks for hosting. If it's not too late, I'm sharing a link to my post about my presentation on pets and reading (at ILA): https://poetryforchildren.blogspot.com/2018/07/reading-with-pets.html And THANK YOU for writing up your week for us. It sounds marvelous and I'm so glad the PoFo (love that!) is doing this! I love the poetry = art connection! Brilliant! Was this their first time to offer this institute? Do they plan to continue? Hope so! I love Poetry is Art Class with words! Yes! This sounds like a fabulous gift. I wonder if substitute teachers would qualify. Lucky you and your students. Back in the day (and now sometimes when .I sub) in my classroom I would tell my students that poets are word artists. I'd put a variety of styles of poems on view ( I used projection device because we didn't have Smartboards.....) They were quick looks to see "tall skinny poems", poems in chunks (stanzas), concrete, short, tall and wider poems etc. This was 3rd grade. From all the prior excitement of being able to recite together 6-8 poems by the 3rd week, they were hooked on poetry and eager to see examples of the words on the page. But poetry described and connected to art is brilliant. I can so see it. Style. Endless choices, combinations, permutations. I also described poetry as music without the tune. It was so organic, the reciting and then the ability to pause, be loud or soft, fast or slow, with reverence or a grin in your voice.....so many ways to say the same poem.....(even though the reciting we did was more singsong at first.....so they could stay together without help or direction from me.) And then the writing. Choices, freedom, guidance as needed...and poems so meaningful, and varied. I love that you bring so much to your students. I just yesterday met with a librarian in the next town and told her about your Progressive Poem. I have arranged a visit by Nikki Grimes to 2 schools in my area. Auburn, NY is home to Harriet Tubman's (northern) home and gravesite. So this amazing librarian will immerse the kids in some poetry experiences and I thought of your NaPoMo project from this year. How I would love to attend that Chicago workshop!!! Looking forward to more details from you. Your sandwich poem and ode to turquoise( still a favorite) are so richly vibrant. Word Art. Such a blessing poetry, poet friends, Poetry Friday.